Ex Spink auction 28 March 1995 and formerly in the collections of Dr S. Z. Ross and Norman Holme. Thomas Llewelyn George Griffith was born at Chadlington, Oxfordshire, on 8 October 1857, eldest son of the Reverend Thomas Llewelyn Griffith, M.A., of Pen-yNant, near Ruabon, North Wales, and Rector OD Deal, Kent, and Mary Moncrieff, his wife, daughter of Brevet Major George St Vincent Whitmore, Royal Engineers. He was educated at Marlborough College and at the Priory at Croydon, passing his Army examination as well as those at Sandhurst and Edinburgh, where for a period he was attached to the 78th Highlanders. On 14th August 1877 he was gazetted as a Sub-Lieutenant into the 2nd Battalion, 24th Foot, his commission being antedated to 11 November 1876. He joined the battalion at Chatham in October 1877, and on 1 February 1878 embarked with the regiment for the Cape of Good Hope. He was present during many operations during the Kaffir War and saw much service with his battalion. In November 1878, he joined the force preparing for the invasion of Zululand, and took part in the subsequent advance into that country, being present at the storming of Sirayo’s stronghold in the Bashee Valley, afterwards proceeding to Isandhlwana. On the morning of 22nd January 1879, Griffith left Isandhlwana with the main body of the column under Lord Chelmsford, but subsequently rode back on special service with Major Smith, Captain Gardner and Lieutenant Dyer, to convey the General’s orders to advance the camp. Colonel Black, visiting the battlefield five months afterwards, for the purpose of burying the dead, found the bodies of some sixty officers and men lying in a group, giving evidence of their having gathered together and fought desperately to the last. Among them were the remains of Captain Wardell, Lieutenant Dyer and a captain and subaltern of the 2-24th, the latter, it is believed, being the body of young Griffith. A memorial lectern in the parish church of St Leonard’s, Deal, marks the estimation in which he was held by those round his own home, having been placed there by friends in his father’s parish and the neighbourhood. 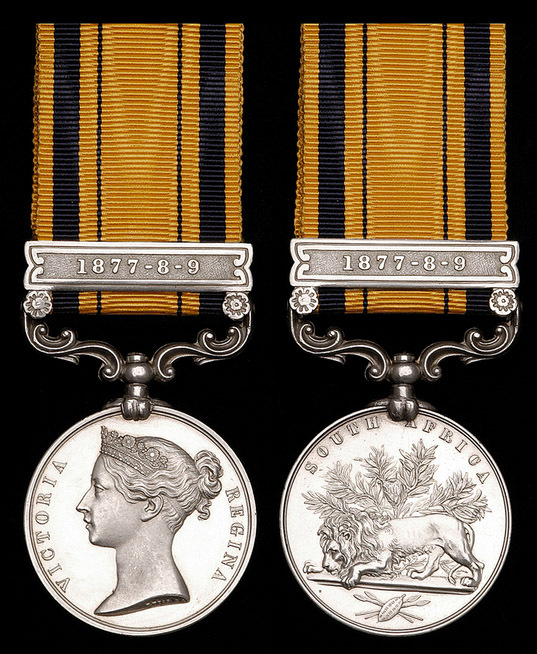 His South Africa medal with clasp 1877-8-9, incorrectly named ‘Griffiths’, was issued on 30 June 1882. The above information was extracted from The South African Campaign of 1879, by J. P. Mackinnon and S. H. Shadbolt, and The Noble 24th, by Norman Holme. SAGS (1) 1877-8-9 (995 Pte H Slade, 2/24th Foot). Those certainly were the "good old days"! On the other hand ........... In 1961 when the GB and ZA currencies were on a par, in my first job I was paid 95 ZAP's a month as a geologist for a large mining company and I was rich! By 1971, I had fallen on hard times and I was employed in a museum earning about the same. Spending an entire months salary on a medal would have been unthinkable. By 2002, spending 13,000 GBP for a medal would have been totally impossible. This means I was destined never to possess the medal of an Isandlwana casualty. Where did I go wrong? My casualty " 290 Samuel Connors 1st 24th Foot" had to go to pay for my wedding 20 years ago. All in all I consider a good deal particularly since I got a Suez NGS Medal to 45 Commando and a Monte Cassino SA Artillery group thrown in with the bride. As an aside....I took the medal back to Isandhlwana in '95 when I visited the battlefield. Per chance the late David Rattray was there with a tour group and my brother-in-law and I were invited to tag along. A memorable visit since Rattray gave an emotional eulogy on the last movements of the 1st 24th Foot with Connor's medal in his hand. Rattray latter suggested that we took the road to Fugitive's Drift and met him at his lodge for supper. With the medal secure in my pocket (and without accompanying impis ) walked the route and as the river was high, we swam the Buffalo - a privilege denied the recipient. I still take medals back to field from whence they were earned but this was special. Looking for Salutries, Salootries and Veterinary Duffadars. I collect primarily QSAs to Indian Recipients. Thank you for a post filled with good news about the advantages of having medal collecting as a hobby. Medals are indeed a good investment in hand should an important event need financing, and they can bring major benefits if displayed at the right time, in the right place, and to the right person. PS Belated congratulations on your choice of a bride and her dowry. 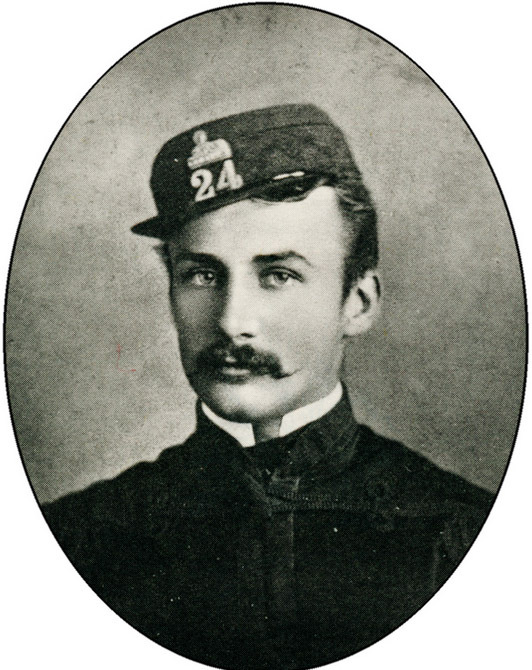 George P. Brierly was killed in action at Isandhlwana on 22 January 1879. He attested at Manchester on 27 July 1868, and served in “G” Company. His effects were claimed by his father. 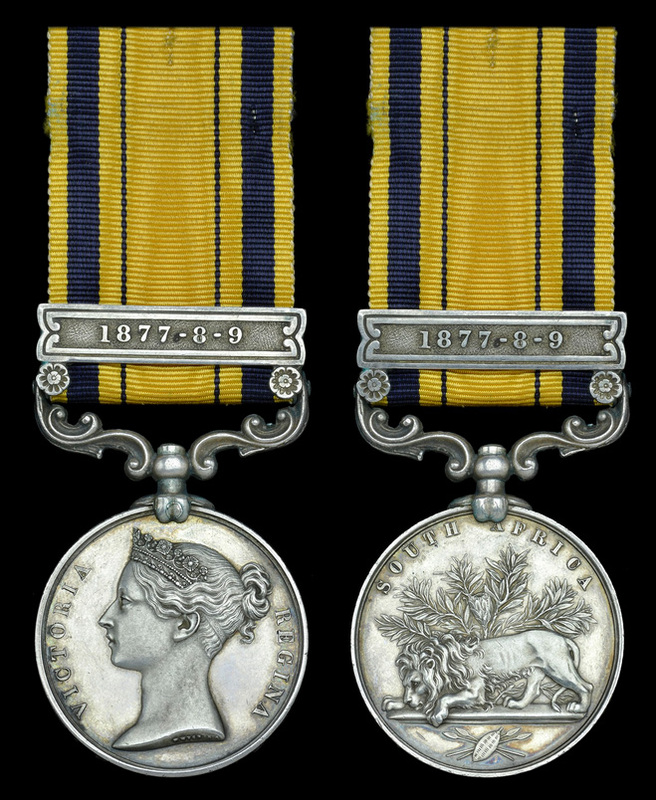 Medal issued 25 August 1881.